Manure is the waste from animals. It can be obtained either from natural deposits or livestock farming. The content of manure is highly variable, and each batch must be analysed if it is used for nutrient supply for crops. We recommend reading Natural fertilizers for vegetables with this article. Manure is different from compost. It must be cured so that easy decomposed material such as cellulose, hemicellulose and sugars are removed. The curing process retain as much humic acids and nutrients as possible. To achieve this, the fresh animal waste, not yet manure, is compacted on a heap so that anaerobic 1)Anaerobic conditions are oxygen deprived conditions exist. The biggest problem in maintaining a rich nutrient content in manure is nitrogen. Mineralization of various proteins and hydrolysis of amides creates ammonia salts, especially volatile dissolvable ammonium carbonate (NH4)2CO3. 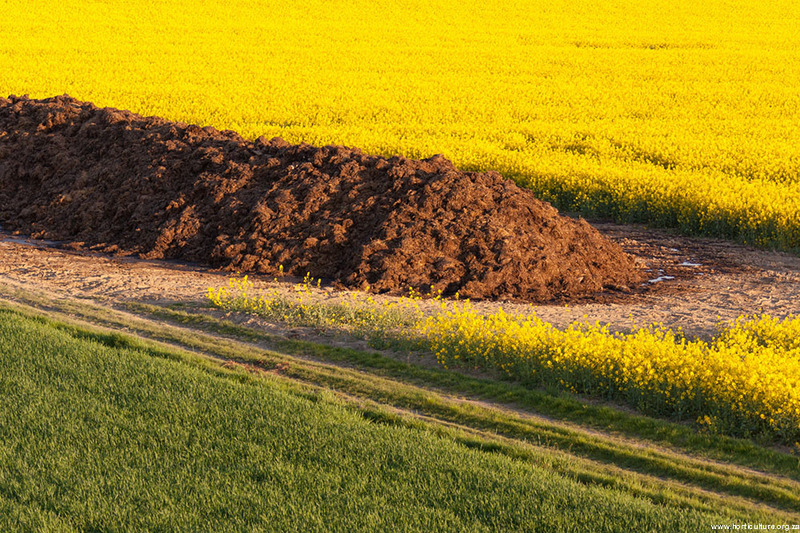 Manure heaps are left in the open and that causes loss of nutrients in two ways; leaching and evaporation. Leaching can be prevented by covering it with plastic or placing it in a barn. If the manure gets too dry, many of the valuable nitrogen nutrients are evaporated since the original molecules become volatile. Adding superphosphate solves the problem. Superphosphate converts ammonia carbonate to non-volatile and stable phosphate and sulphate. This process reduces nitrate leaching, but it also converts the water-soluble phosphate to unavailable tri calcium phosphate. The curing process must be done in the absence of oxygen. That is called anaerobic conditions. If, however for some reason the pile becomes oxygenated the conditions turn aerobic. The oxygen will cause nitrification of the ammonia which are easily leached. What is worse is if the manure gets wet after it dried out. Large amounts of nitrogen are lost through nitrogen gas N2 and N2O. As the manure cures, its volume is reduced through carbon loss and the concentration of nutrients increase. Manure from sheep has less roughage so the curing process is slightly different and faster than that from cows. In some cases manure from sheep grazed in arid areas such as the Karoo have a high concentration of sodium which can lead to the increase of soil pH. Animal waste is converted to manure. It is obtained either from natural deposits or livestock farming. The content of manure is highly variable, and each batch must be analysed if it is used for nutrient supply for crops. Manure is different from compost. It must be cured so that easy decomposed material such as cellulose, hemicellulose and sugars are removed. The curing process retain as much humic acids and nutrients as possible. To achieve this, the fresh animal waste, not yet manure, is compacted on a heap so that anaerobic (Anaerobic conditions are oxygen deprived) conditions exist. The biggest problem in maintaining a rich nutrient content in manure is nitrogen. Mineralization of various proteins and hydrolysis of amides creates ammonia salts, especially volatile dissolvable ammonium carbonate (NH4)2CO3. Manure must be cured in the absence of oxygen. That is called anaerobic conditions. If, however for some reason the pile becomes oxygenated the conditions turn aerobic. The oxygen will cause nitrification of the ammonia which are easily leached. What is worse is if the manure gets wet after it dried out. Large amounts of nitrogen are lost through nitrogen gas N2 and N2O. As the manure cures, its volume is reduced through carbon loss and the concentration of nutrients increase. Manure from sheep has less roughage so the curing process is slightly different and faster than that from cows. In some cases, manure from sheep grazed in arid areas such as the Karoo have a high concentration of sodium which can lead to the increase of soil pH. The most common sources of manure are Guano, poultry farms, bat caves, dairies and sheep farms. The content of the different manures is shown below. Guano comes from the Spanish work bird manure. It is usually sold as a fine white powder with a strong smell of ammonia. As been mentioned before, the content varies considerably from year to year. 75% of the nitrogen in Guano is in the form of urea (carbamide)(CO(NH2)2), ammonia carbonate (NH4)CO3), ammonium sulphate (NH4)2H2PO4) and uric acid. All these compounds are readily available to plants which makes Guano so popular. Because of the high concentration of nutrients and especially the ammonia component, it is mostly diluted and used as top dressing. The other 25% is in the form of proteins that are slowly mineralized over time. This makes Guano a good slow release fertilizer of nitrogen. In vegetable farms Guano is mixed with other manures or compost to balance out the nutrients. It cannot be used on seedlings as the ammonia content is too high. A typical recipe for Guano in vegetable farming would be in the ratio of 10 : 0.3 : 0.2 t/ha – compost to superphosphate to Guano. Chicken manure is becoming popular because of the growth of that industry. It has significantly less nitrogen and phosphorus than Guano, but overall it is the same. The content of chicken manure can vary considerably depending on how much other organic material is mixed in. Common materials with which it is mixed are sawdust and hay. Chicken manure is applied at 2-5 t/ha. Bat manure is also used and is like guano but with the nitrogen released more slowly. In some cases, bat manure is sold more for its phosphate content than nitrogen.